Tomorrow is the Spring Equinox, it is officially the first day of Spring. 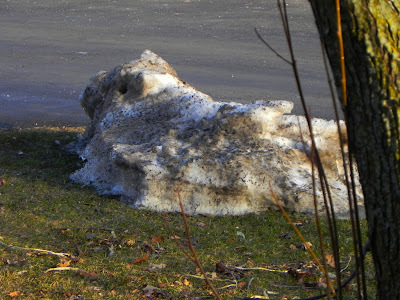 It has been very, very long winter with lots of snow. We've had a couple of nice days where it got up into the 60's. This here is the last vestiges of snow on the lawn. Until next week. It's supposed to snow. Again. March 19, 2011 @ 7:45 a.m.